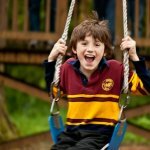 The swings are a definite favorite of most kids. Climb up onto the platform and hold on as you launch yourself off in one of the two big swings. Once you get off, you will be right back in line to go again. While waiting, you may also enjoy sliding and playing on the structure. 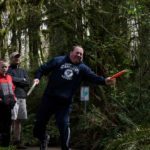 Trout Creek’s nine-hole disc golf course is a fun form of recreation as hike around camp. Each hole poses a different set of challenges as you try to stay below par. 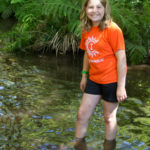 Whether you want to watch the ripples, dangle your legs over the water while sitting on a bridge, walk in it, or try to catch some crawdads, the creek is a great place for everyone to have a good time. While living in the hustle and bustle of city life, it can be difficult to find the time to really appreciate the beauty of God’s creation. Hiking on one of the many trails around camp is a great way to experience the nature around. 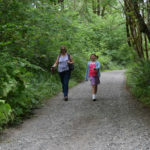 There are many places to explore such as the Beaver Dams, Trout Creek Falls, the Bluff Loop, or the Sandy River and much more. The following activities are available for your retreat, however there are additional fees for these activities. Please check rates for fee information. 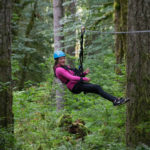 The zip tour is a fun activity for all adventurers 12 years old and above. Experience the thrill on our upgraded Zip-line Tour! Fly 150′ to the Crow’s Nest, towering 75′ above the forest floor. Then clip on for the final 100′ of this exhilarating ride. The zip-line is a great activity to add to any retreat. 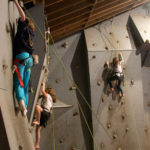 The climbing wall is a great challenge for both the young and old (minimum age of 8). You can test your skills and strength as you work your way up one of the 5 unique rock walls. All climbers are harnessed in to ensure they can challenge themselves without the fear of falling. The wall is a fun activity to include in your retreat. The pools are a great place to stay cool and have fun. 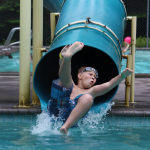 Campers can enjoy the shallowness of the game pool or the diving board and our 46 ft. water slide in the deeper diving pool. The pools are available from Memorial Day to Labor Day. 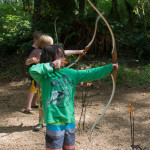 Our archery range is a fun place to experience a bit of the “old west”. We provide the arrows, bows, and targets—you provide the strength and aim. 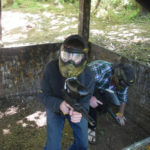 Paintball can be a great addition for retreats. We provide all the equipment necessary and the outdoor course.